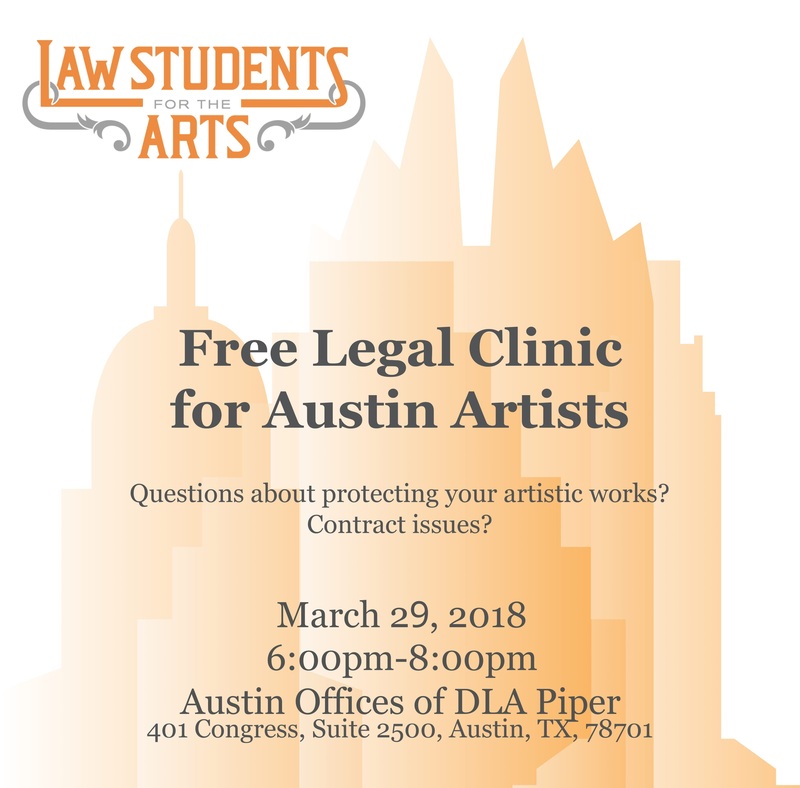 Artists, come receive FREE legal advice on any art-related issues you may have! Free consultation with an attorney. Call from anywhere in Texas. Get organized and prepare for the future. Austin friends! 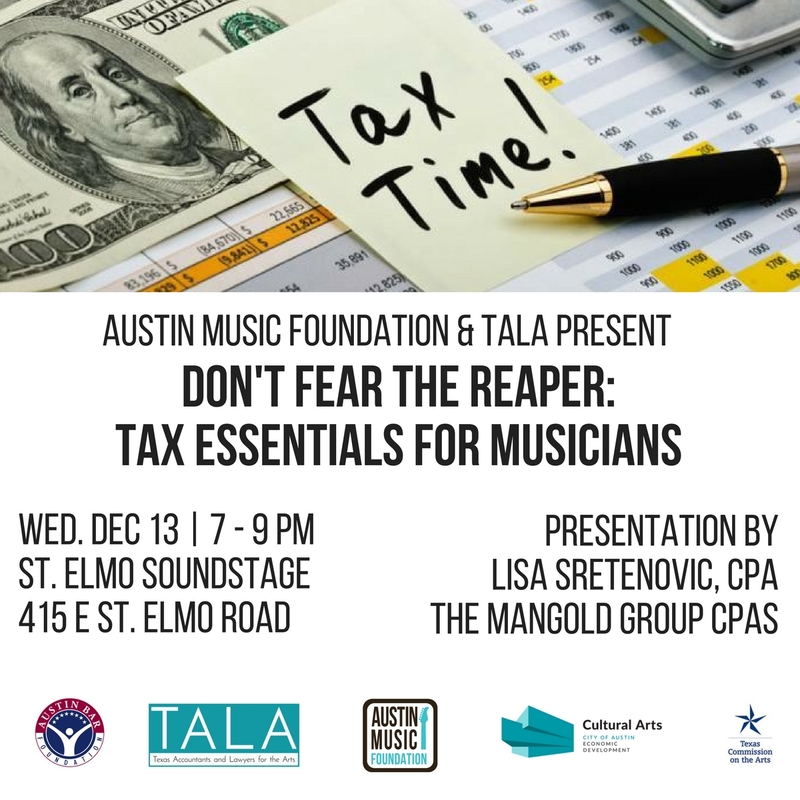 If you missed our Art of Taxes seminars, here’s one last chance to talk taxes with TALA. 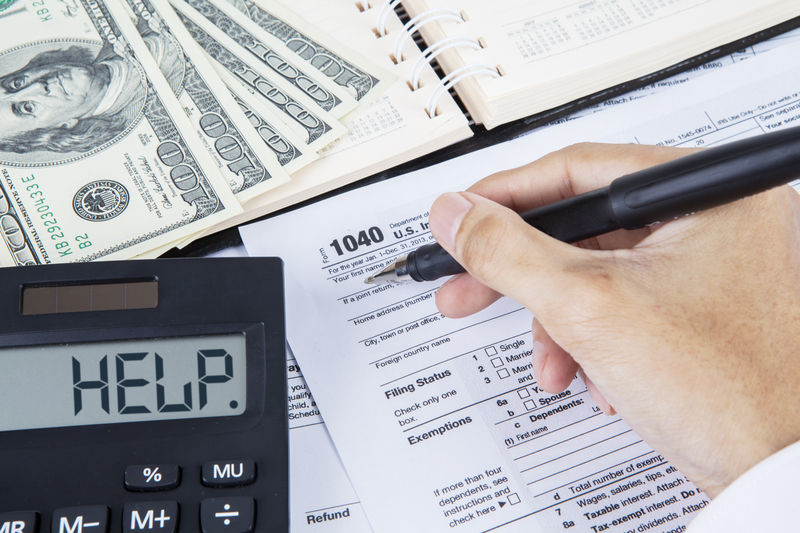 Join us on consecutive nights, February 19th & 20th, for seminars covering copyright and taxes. 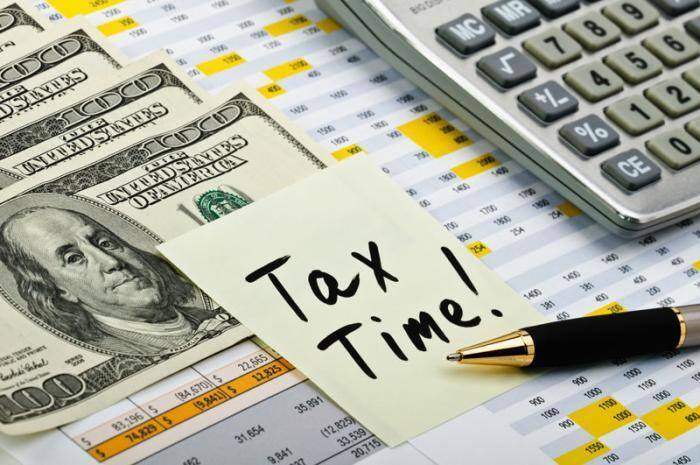 Get a jump on tax time at one of our Austin seminars. 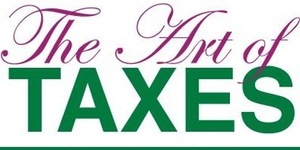 The Art of Taxes – Now in two editions! 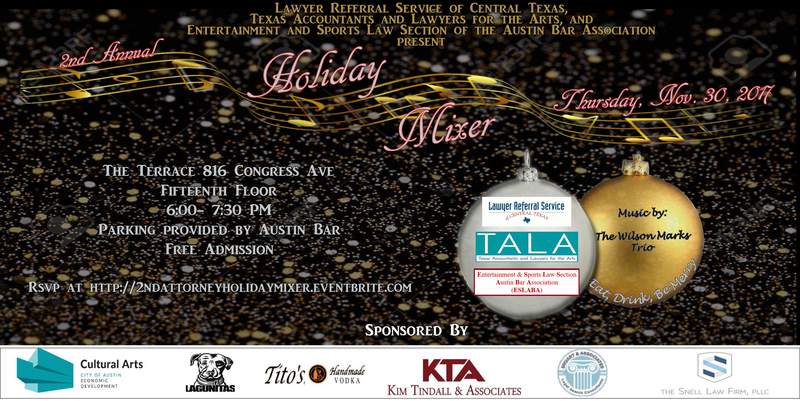 Kick off the season with TALA, Lawyer Referral Service of Central Texas, and the Entertainment and Sports Law Section of the Austin Bar Association. Join us for an evening of festivities. Artists should consider protections for themselves and their art. 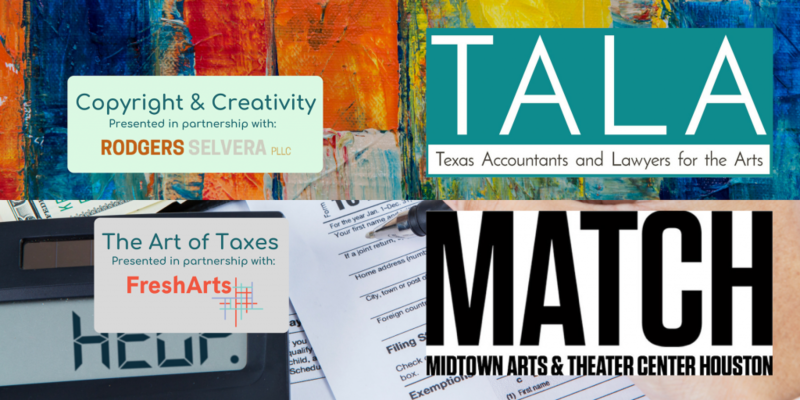 Join TALA for tips to successfully operate your artistic practice as a business. 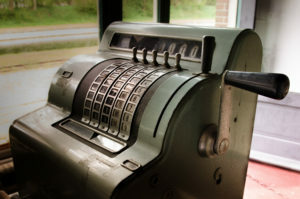 Artists must also function as businesswomen (and businessmen too). 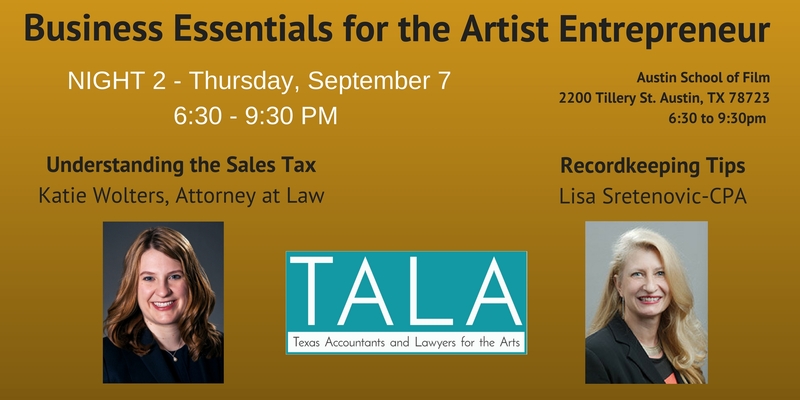 Representatives from Texas Accountants and Lawyers for the Arts (TALA) will provide basic tips to successfully operate your artistic practice as a business. 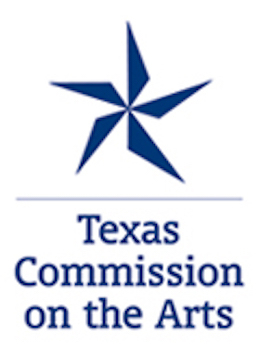 Are you a visual artist who collects and remits Texas sales tax? If not, maybe you should! Join us as attorney Kevin Oldham shares his expertise gained through years of experience with the Texas Comptroller and in private practice. Let’s Mix It Up!! Cocktails, Conversations, and more…. We wanted to celebrate the summer in the best possible way…with a mixer (indoors and with AC)! 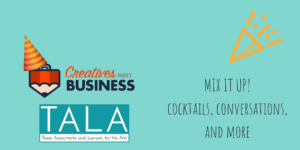 We’re partnering up with our friends at Creatives Meet Business to help better connect all sides of the creative community – the artists and the industry that supports them! Come on out and join us for an evening of cocktails and conversations! 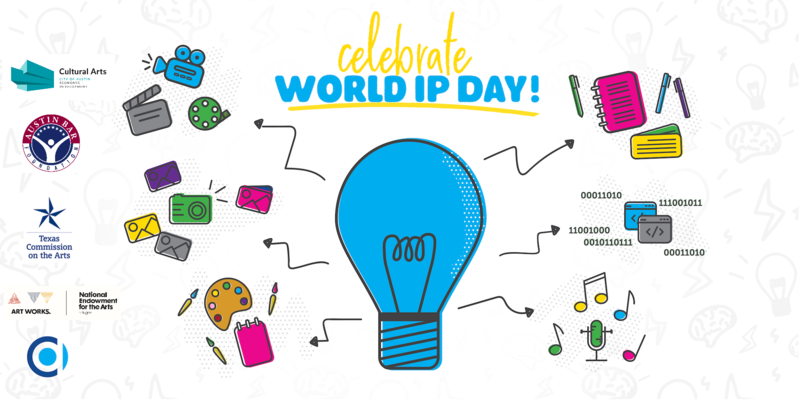 In partnership with the Copyright Alliance, TALA is celebrating World IP Day with a Creativity Forum in Austin. 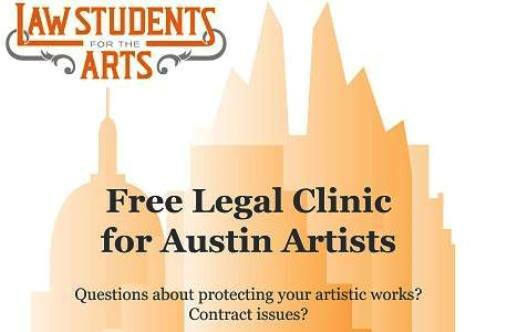 Get your arts-related legal questions answered. 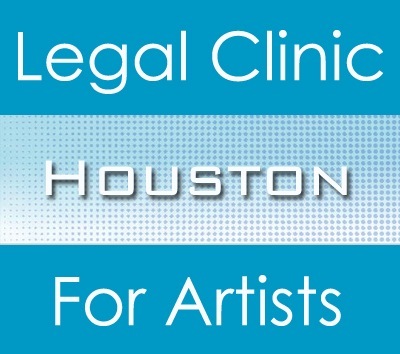 Sign up now for your one-on-one consultation with an attorney in Houston. 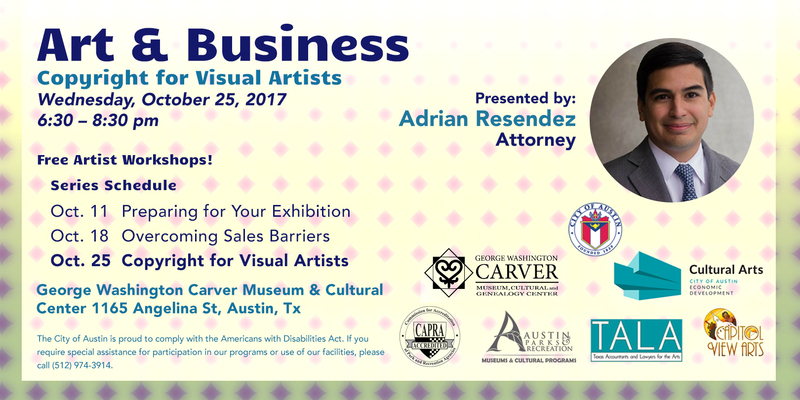 AUSTIN SEMINARS: COPYRIGHT FOR VISUAL ARTISTS is the third in a three part series addressing business topics specifically for visual artists. 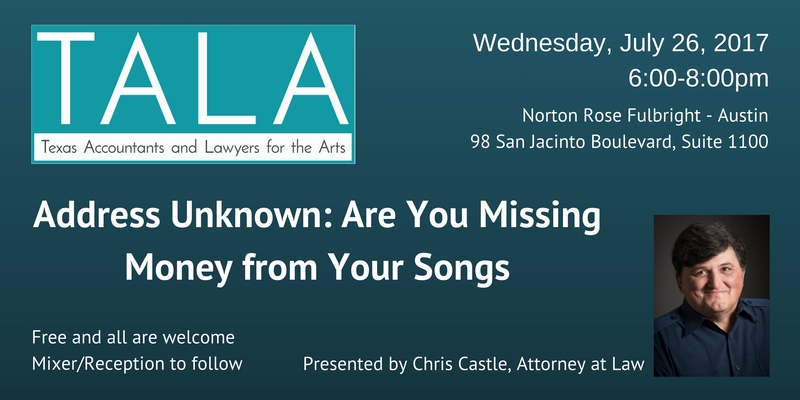 RSVP here for Address Unknown: Are You Missing Money from Your Songs! 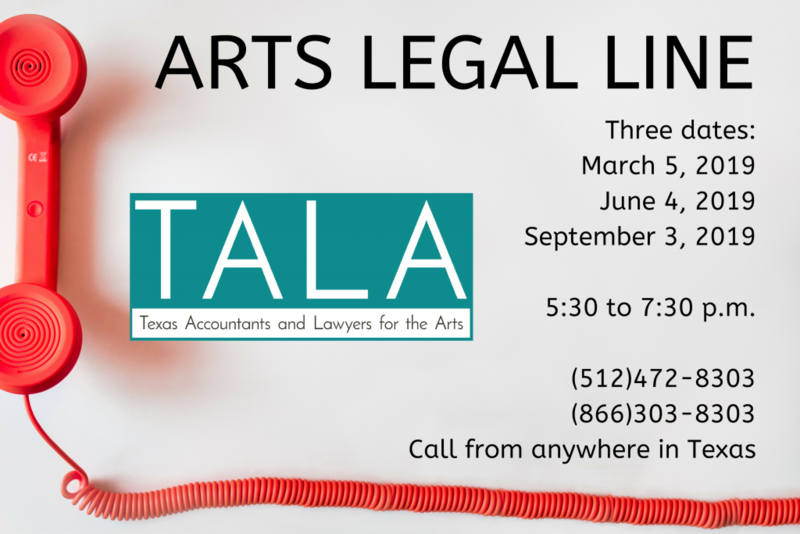 Please Amplify TALA during Amplify Austin! More info about the Amplify Assembly event here. 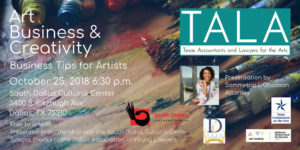 Join TALA at Austin Public for the second annual Amplify Assembly @ Austin Public! Amplify Assembly 2017 is an official kick-off event for Amplify Austin Day and is brought to you in partnership with I Live Here I Give Here, the host of the city’s 5th annual citywide day of giving. Come out, be part of the fun! 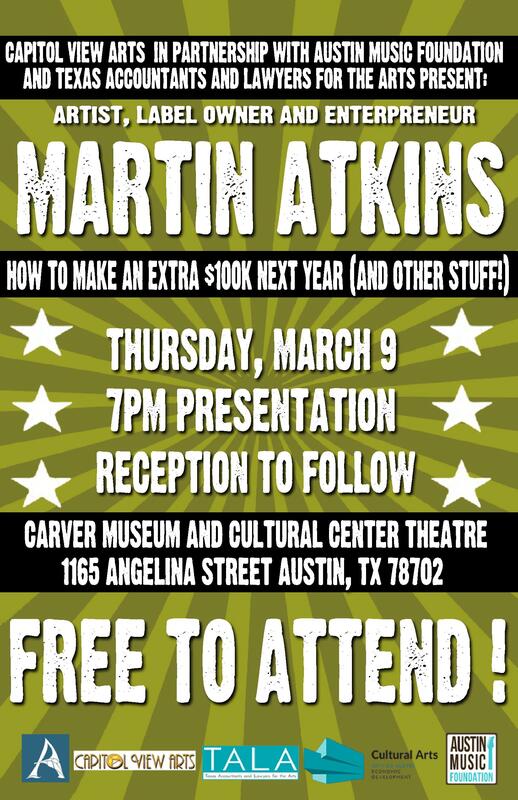 We hope to see you at Amplify Assembly @ Austin Public on March 2, from 6-9M! 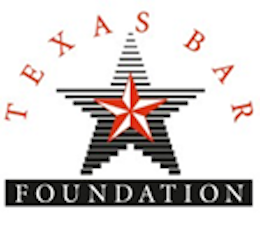 Houston Fundra iser: Drop by Okra Charity Saloon in Houston at 924 Congress during January 2017 and show your support for TALA. 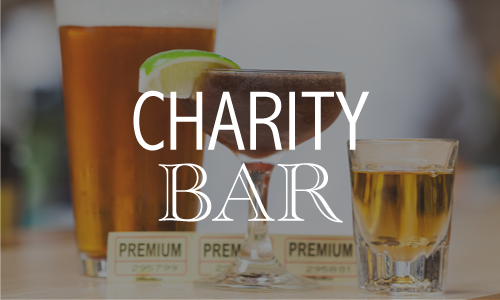 You’ll receive a ticket for each drink purchased and can “vote” for TALA to receive February bar proceeds. 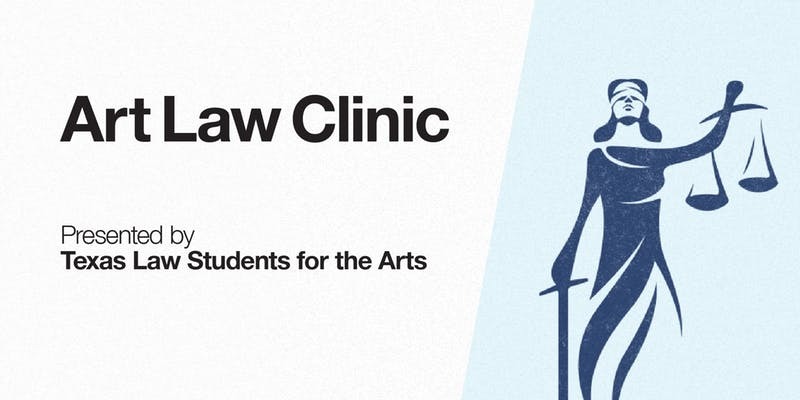 Special thanks to Fresh Arts for partnering with TALA to present this clinic. FREE TO ATTEND! 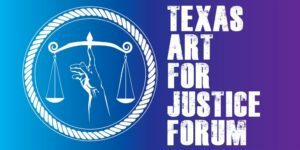 SEMINARS IN AUSTIN AND HOUSTON FEB 2017. 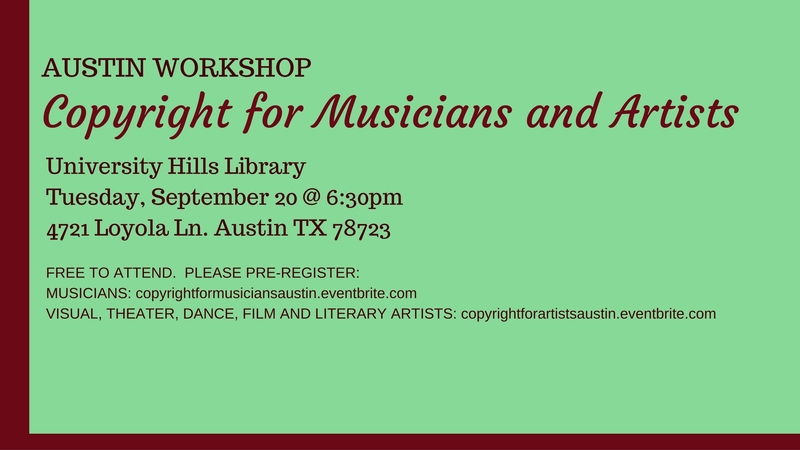 Please join Austin, Texas-based entertainment lawyer, Amy E. Mitchell, for an hour-long workshop that will cover fair rights, use of copyrighted materials, and music licensing for your next film project. 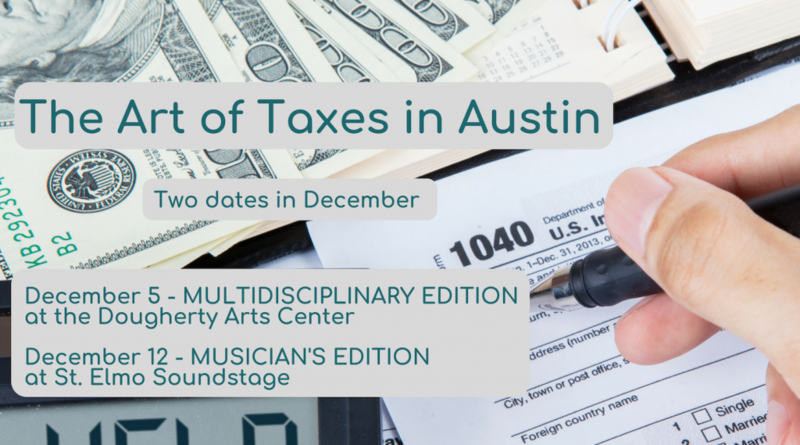 Contact: afs@austinfilm.org. 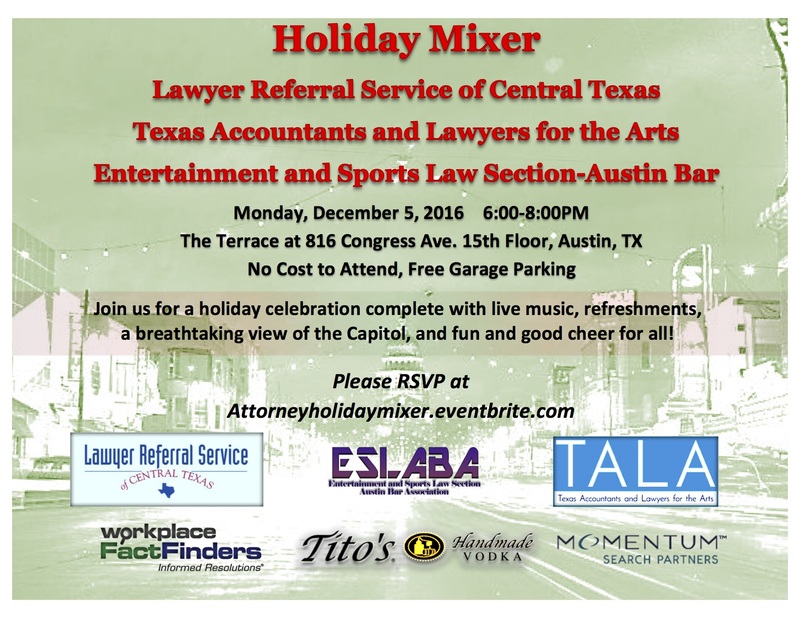 Join Texas Accountants and Lawyers for the Arts, Lawyer Referral Service of Central Texas, and the Entertainment & Sports Law Section of the Austin Bar Association for a holiday mixer on the beautiful Terrace at 816 Congress. 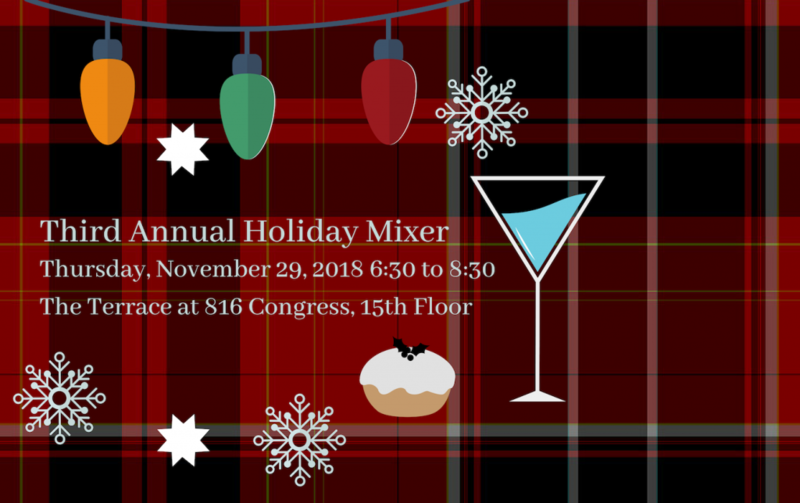 Enjoy light bites, refreshments, music, wonderful views of the State Capitol, and great company as we kick off the 2016 holiday season. Parking provided complimentary from the Austin Bar Association in the parking garage for 816 Congress. Enter the building garage on 9th St.
RSVP for the Mixer here. All music teachers invited. Free to attend. Is your art protected? 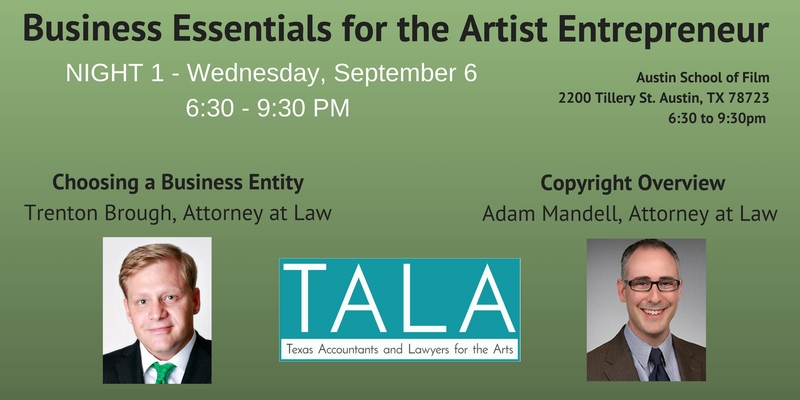 Join TALA for a comprehensive discussion of copyright fundamentals and how to protect your work. 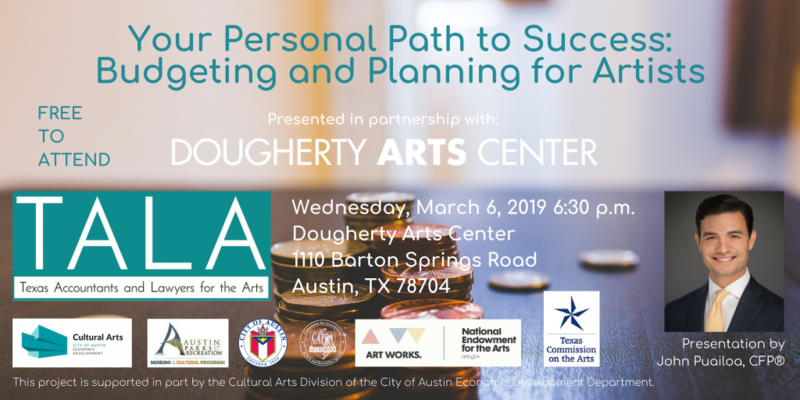 This multi-disciplinary presentation includes registering your work, your rights as a copyright owner, fair use of copyrighted material, and more. There will be time allowed for Q&A after the presentation. 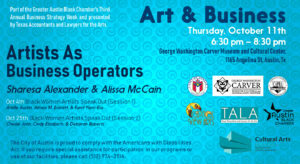 Join TALA at the Getting Connected event on Wednesday, Aug 31 @ 3pm. In the creative industry it is important to make sure you always Protect Your Assets when working with others. 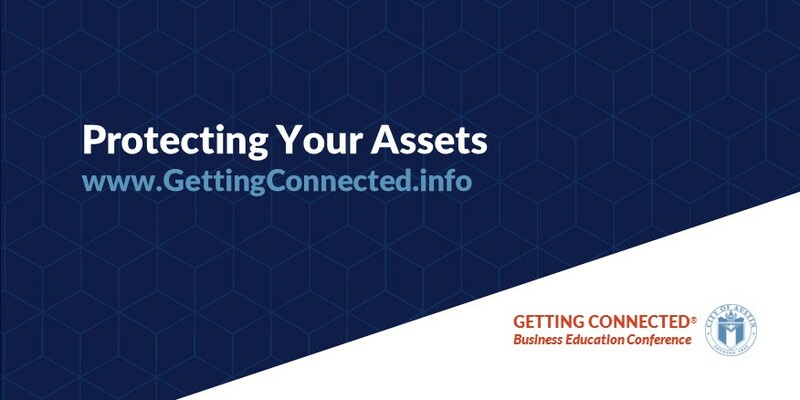 Brooks Rice Law and TALA will be at #GettingConnectedATX to help you decipher the legal world and protect yourself when entering contracts and partnerships. 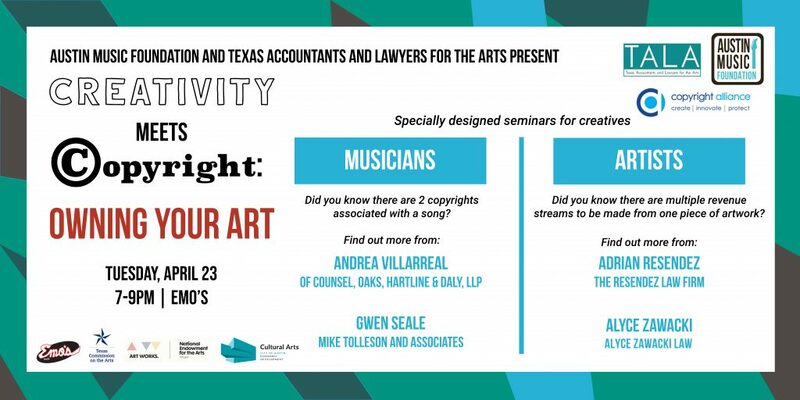 REGISTER HERE for Copyright for Musicians and Artists in Houston!